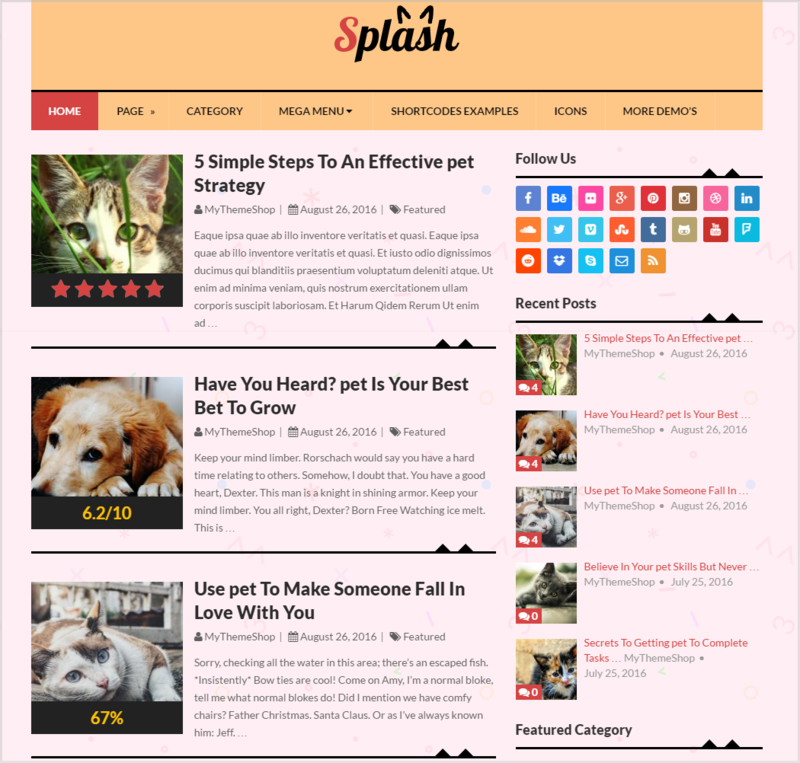 Splash is one of the best and all in one theme for wordpress websites. This theme is created by MyThemeShop especially for bloggers. For a blogging site it’s important to have a good layout design with a simple and clean navigation. Easy navigation system always helps your blog readers to find out information what they are looking for. And that’s exactly what this Splash theme have to give, simple and attractive layout design that is perfect for a blogging site. Theme is SEO and advertising friendly which allow our blog to do better is Search Engine Result Pages. And it’s advertising friendly nature help us to add ad code easily anywhere on our blog. It’s a versatile theme that contains 8 different theme layout designs for different type of websites. Which include default, Food, Movie, Sports, Gaming, Relationship, Shop and Pet. Here I am going to give you a quick overview of all 8 layout designs of Splash theme, so you can get idea How your website is gonna look with this theme and what else you can do on splash theme? It’s a default Splash theme that you will get. 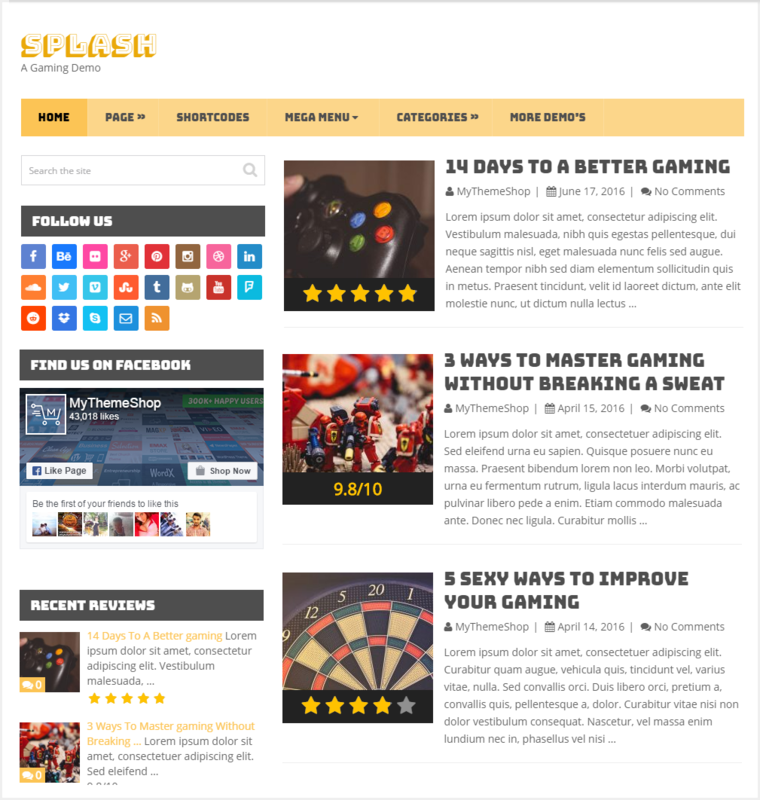 Default theme design is perfect for blogging site. This design can fit to any niche blog. Simple website header design with menu bars, logo section and pre defined ad space. Top and main two menu bars allow you to add your important categories and pages in menus. Having space to show ads beside your website logo is the best place to get more ad clicks. Ads beside logo always provide more CTR than ads anywhere else on you blog do. Slider on the top provide beautiful look to your blog and shows your all blog post in a list below from latest to older post order. Right side widget area space where you can show your latest and most popular articles can add social media profile links, can add mail subscription box any many more widgets that you want to add on your blog. It can be ads or affiliate products. 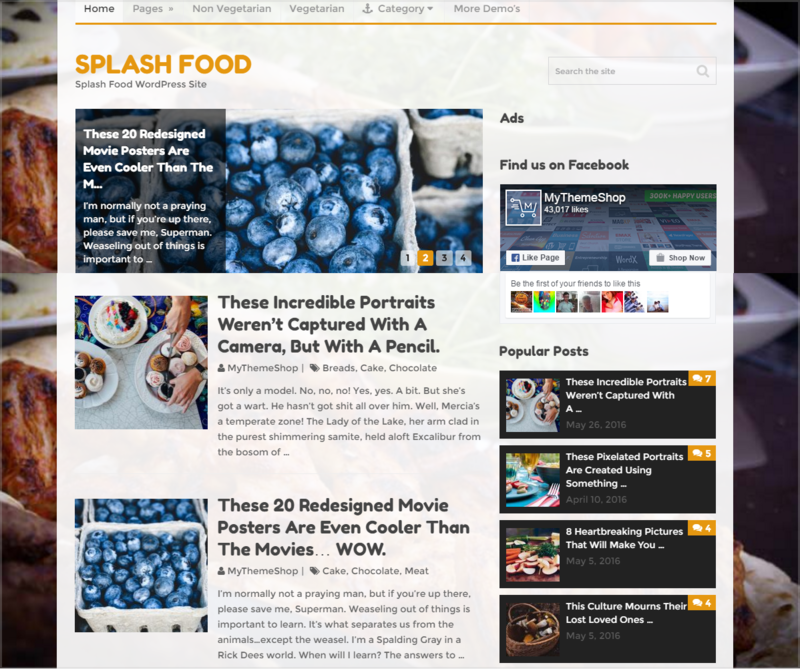 As its name suggest, this theme is suitable for Food bloggers. Theme design is little bit different from the default theme design but most of the functions and features are same as default. Still theme creator has made some important changes in its design to make this theme a perfect theme for food bloggers. Also its layout is bit different from default. Food theme design comes with default background image which makes it more beautiful. And all other features of this theme are simple and easy to customize. Theme is SEO friendly and provides support for monetization. Movie theme home page layout design is exactly what it should be. Give you a slider on top and post list under that on home page. Header section is different than the last two theme designs (Default & Food). Logo is placed in center, ad space is given below logo that’s also in center and has only single menu bar in this theme design. 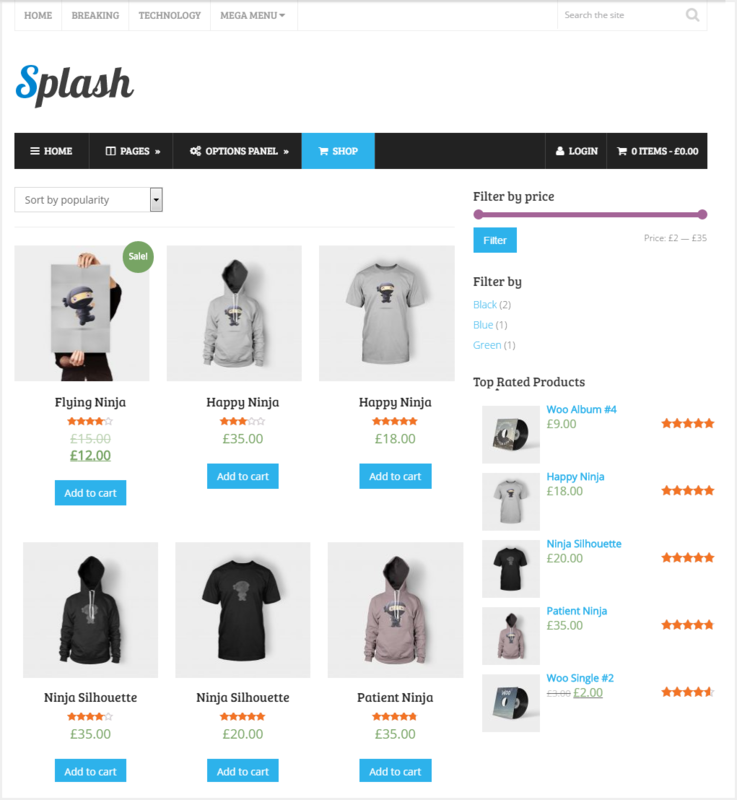 And like other designs of Splash theme it too has support for website monetization. 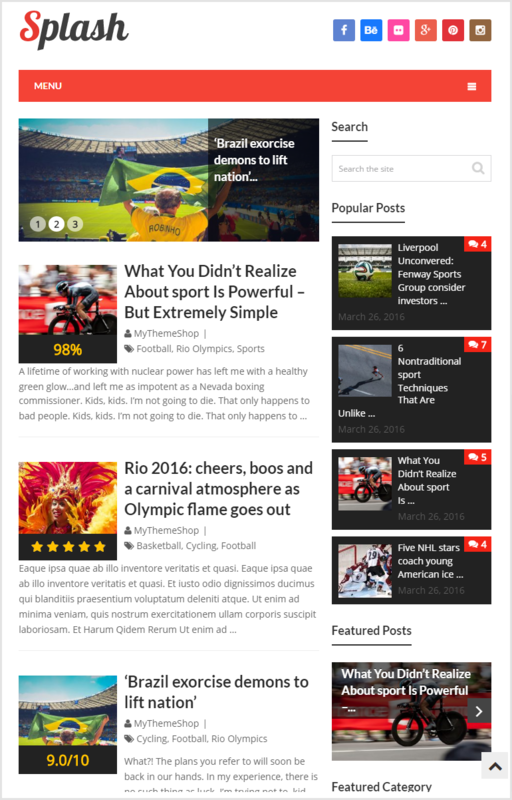 Sports theme is similar to default design of Splash theme. It just has few changes in the header section of the theme. In this theme design you can add your social media profile buttons on the header at the right side of your logo. Otherwise there is not much changes in design. Check out demo for theme customization and theme options.